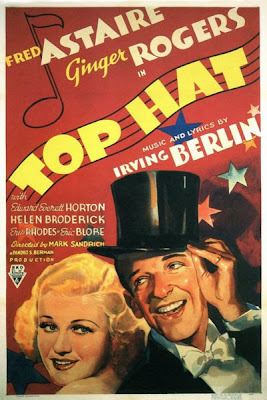 Fred Astaire and Ginger Rogers in 1935's Top Hat. Our parents and grandparents really did have it right. . .
Time to leave the wonderful ocean and northern Fornicalia coast and head back home -- taking care of some very important personal business first. Already I miss the place. If I could somehow afford it or wangle it, I'd live here in a heartbeat. So no post today -- we're on the road again. What are your favorite "road songs"? 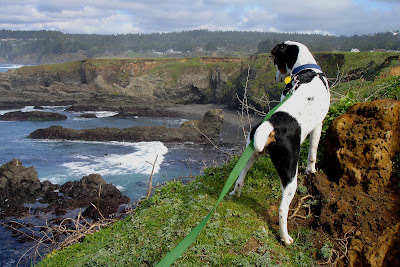 Two days ago we visited the Mendocino County Animal Shelter -- as opposed to the Mendocino Humane Society -- and came across a dog who, due to overpopulation at the shelter, had to live in the office. His name was Buddy. At first he growled at us because, after all, it was his office. But there was something in him that just seemed to resonate with us. My wife said: "He would be a great dog." 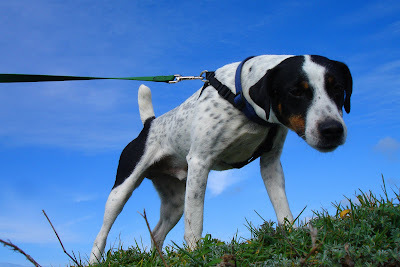 He was a Fox Terrier / Jack Russell mix. I thought: now there's a veritable uncontrollable whirlwind if ever there was one. Two days later we visited again and took him for a walk. He was quite the gentleman. Two days after that, we were called: we could adopt him. Driving him down Main Street, he was already recognized by someone in a red VW. "Is that Buddy?" the driver asked. "I've walked him. Glad he got adopted!" Another person recognized him on a walk: "That Buddy? He's a great dog." We had already adopted one dog from the Humane Society next door (back in May of 2009) -- that was our dog Lilly, documented here. It turns out that, once we acquired her trust (took about two months, though), she was and is a great dog! That said, it turns out that Teddy appears to be the anti-Fox Terrier. He walks well on lead. He is astoundingly polite. He hasn't barked even once. We bought him a cat-bed and he's already made it his own. He's already seemed to be making himself "at home" wherever we've been. We left the earlier motel where no dogs are allowed, and are now staying two additional nights at another "dog-friendly" motel with direct access to the ocean. What an amazing little dog. 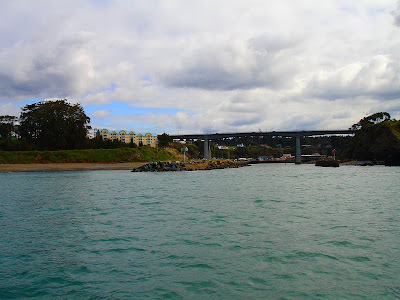 The waves have subsided, and my wife and I decided to partake of a whalewatching tour from Noyo Harbor. 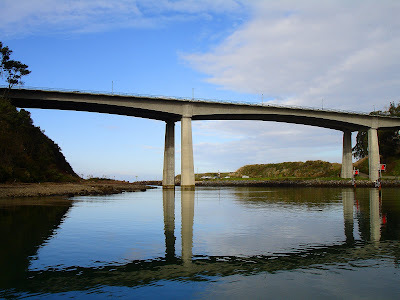 Above, from the boat Trek II, looking west towards the Highway 1 bridge. As opposed to photos taken safely from the hotel room high above the waves on dry land -- now, on this tour, we were at the same level as the crashing waves! 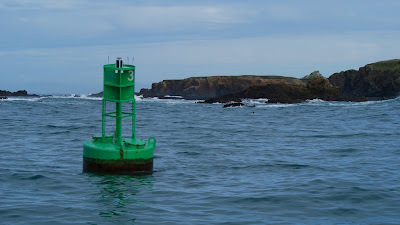 The now-calm green #3 buoy as we exit the Noyo Harbor inlet towards open ocean. . . 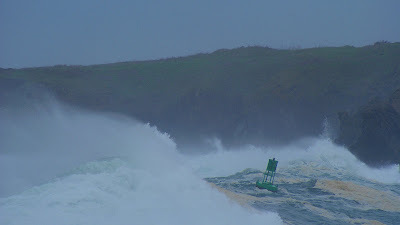 The #3 green buoy only five days earlier, same precise place in the channel! The furthest red #2 buoy. But wait; what's that on board? Of course. 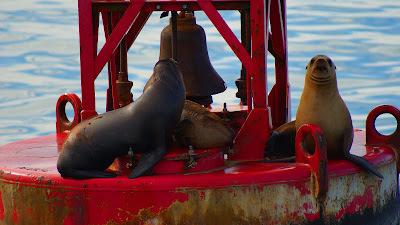 California sea lions! The bell still slowly clangs. How can this not drive these pinnipeds crazy? We spent a good hour waiting. First, some spouts. Then, at a distance, one remote fluke. 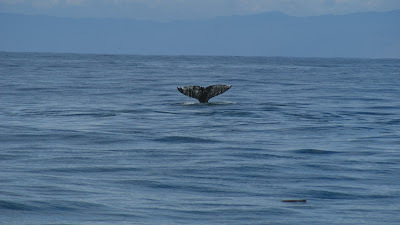 And that was the only whale tail we ever saw. 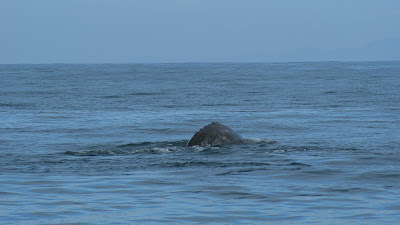 A number of gray whales arched over the surface. But we consistently took the wrong path and were quite some distance from the two pods we encountered. 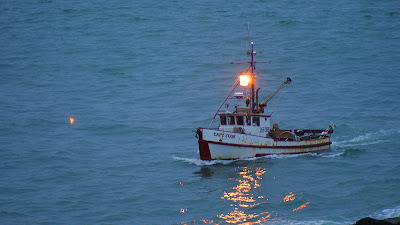 At the end, we steamed back to safe harbor. 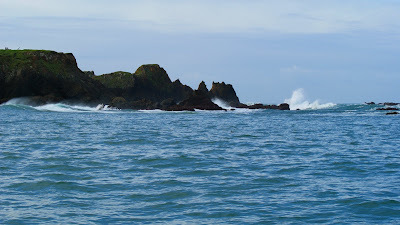 The waters were primarily calm though the rolling swells were a good ten+ feet. It was interesting to note that where the whales sounded and contacted the surface, they left a flat and remarkably undisturbed area in their wake. You could clearly make out where they were -- you could not remotely predict where they would be! 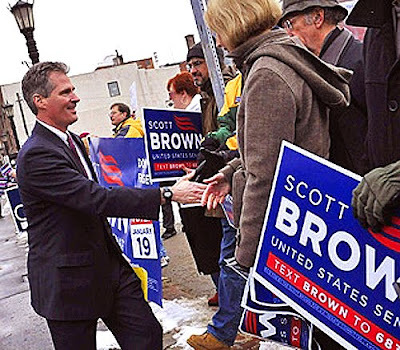 Senator Scott Brown: So THIS Is What Massachusetts Voted For? 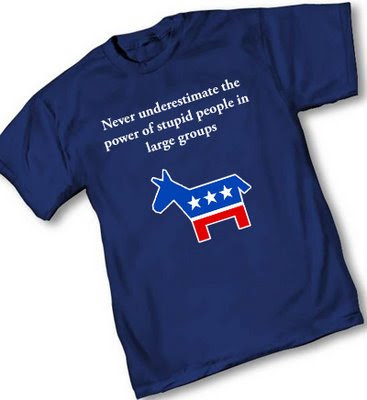 Newly-elected Republican Senator Scott Brown has decided to help the Demorats break the GOP filibuster over the $15 billion dollar jobs bill endorsed by none other than Mr Harry Reid. Rookie GOP Senator Brown says, quote: "I hope my vote today is a strong step toward restoring bipartisanship in Washington." Your vote today, Mr Brown, is a strong step over the "re-electable" chasm. As in: you are not. Just cut to the chase, Senator Brown: pull the "R" and replace it with the "D." Because you, sir, just ensured that you are a one-term senator. Might this not be an indication, to otherwise clear-thinking individuals, that a discussion is in order regards the direction of the Obama Administration? The Rasmussen survey shows support for the health care bill at 39% and opposition at 58%. For liberals in Congress, a massive new entitlement that will bring 30 million more Americans into a program relying on federal subsidies to provide insurance is a 50 year dream. Leaders from safe districts (like Pelosi) seem willing to sacrifice the seats of other members, and even control of the House after 2010, in order to get a comprehensive health care reform passed. Anyone who thought that the election results, in New Jersey and Virginia in November 2009 and in Massachusetts Senate race in January, would lead to a reassessment of the Administration's priorities seems to have misunderstood the liberal passion for a big, expensive, health care reform bill . There has been no pivot to focusing on a job bills, or deficit control, which seem far higher priorities with American voters than health care reform. No televised summits are planned for these subjects. The Demorats are doing precisely the opposite of what they should. After a session of hard work, rough seas, rogue waves, tangled nets, high winds and minimal catch -- it's good to know that there is a calm port waiting for each of us at the end of the day. Our ports all differ. They can range from a person, to a place, to God, and all points considered in between and mixed. Sometimes our ports are slightly-lesser dangerous places than our exposed lives. Sometimes we just have to settle for "slightly-less dangerous." We all have to lay our heads down at some point during a day. We all need some kind of shelter from the storms outside. The Demorats couldn't care less about what it costs or whether you want it. They're just going to do it and everyone be damned. So, did the US military learn anything? Has our country learned anything? 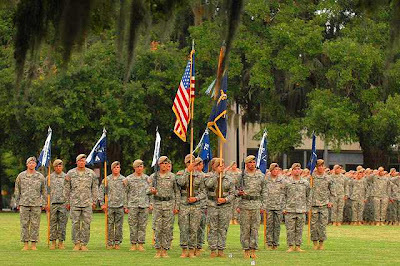 CBN News has learned exclusively that five Muslim soldiers at Fort Jackson in South Carolina were arrested just before Christmas. It is unclear whether the men are still in custody. The five were part of the Arabic Translation program at the base. Patrick Jones, the Deputy Public Affairs Officer for Fort Jackson, confirmed for CBN News Thursday afternoon that an investigation was ongoing. Prior to this posting, CBN News learned that these details were also confirmed by a government official with knowledge of the investigation. The US Army says there is no evidence of this. Read more here. Jihad Watch.org writes here. Ft. Jackson itself writes about the "investigation" here, saying the "investigation continues" on "verbal threats." Pay no attention; the Army fouled up once. It doesn't want you to know it may have occurred again -- involving Islam. But don't say the "I" or "M" words. Ah, Islam, the religion of peace, tolerance, respect for women and all cultures and people. Patrick Buchanan: the man Conservatives love to hate and hate to love. Frequently he can be all over the proverbial grid. Quoted in the New York Times' lead story, "Party Gridlock Feeds New Fear of a Debt Crisis," Hoagland nailed it. At its heart is a fiscal crisis [my emphasis]. After the 2009 deficit of $1.4 trillion, we are running a 2010 deficit of $1.6 trillion. Trillion-dollar deficits are projected through the Obama years, be they four or eight. You are being quite kind, Mr Buchanan. Obama is, to me, clearly on his way to a one-term presidency. Has anyone noticed that I have never written these two words together: "president" and "Obama"? They are, to my way of thinking, mutually exclusive. , in December, had unloaded $45 billion of its $790 billion in T-bills. Is Beijing bailing out? There are three ways to do it. One is through growth that increases the tax revenue flowing into the Treasury and reduces the outflow for safety-net programs like unemployment insurance. And here is where Mr Buchanan and I part company -- as will, I suspect, the bulk of you, my dearest readers. Are you serious, Mr Buchanan? Tax hikes on a federal level? In a Recession? Bordering on inflation and then hyper-inflation? On the cusp of an actual Depression? Republicans are not going to give him a single vote for a tax increase. Not only would this violate a commitment most made to the people who elected them, it would be politically suicidal. For behind the GOP today, and its best hope of recapturing Congress in 2010, are the tea-party irregulars. And tea partiers now play the role of Red Army commissars [my emphasis] who sat at machine guns behind their own troops to shoot down any soldier who retreated or ran. Republicans who sign on to tax hikes cannot go home again. As well they should not! The tea-party folks are not into the Gerald Ford politics of compromise and consensus. They have seen what it produces: the inexorable growth of government. And, on the other hand, we have seen what tax cuts may yield under someone as politically insane and daft as Ronald Wilson Reagan. Principled conservatives are resisting tax hikes because they believe government has grown too huge for the good of the country. 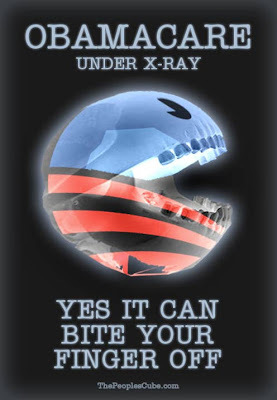 And if that means putting the beast on a starvation diet – no new tax revenue to batten on – so be it. Cold turkey time. Anticipating gains in November, Republicans will not give Obama any new taxes before then. After November, their ranks swollen by tea-party support, they will be even more intractable. Where does that leave Obama – and us? And in response to the so-called "maelstrom"? Nothing would make me happier than a federal government in turmoil and stagnation. But moreover: NOT SPENDING. Patrick J. Buchanan: you are a complete tool, sir. For the past, say, roughly two years I have watched this boat being built under a shelter directly on Highway 20 leading to Fort Bragg. Yesterday I stopped and began taking photos of the boat still under construction. However, this time, there was a banner in front of the fence, as you can see above. I went to the indicated website, Chasina Bay Charters, and discovered that this boat is set to launch in May of this year, and is the featured vessel in the Chasina Bay Charters company. It seems to me this company might just be trying to pay off their vessel on the backs of those persons making reservations the first year. Call me crazy, call me wacky, but I don't know of anyone who would pay $41,000 for 8 days on a 75-foot boat in Alaska. Russell Brice's Himex company (Himalayan Experience) will take you to the summit of Mt. Everest for $56,000 and roughly two months' time, in comparison. Additionally, those able to afford $41,000 for 8 days would surely own a yacht themselves or commission a larger vessel. So, am I crazy? Would people pay this kind of money for a trip of that nature? Or are you thinking what I'm thinking: the owner, in this economy, is going to have to seriously revamp his rates or find no clients? My wife and I are in the midst of spending nine days on the northern Fornicalia coast, right on the ocean, in order to celebrate our third anniversary which -- luckily for me -- is Valentine's Day. Even I can remember that one! 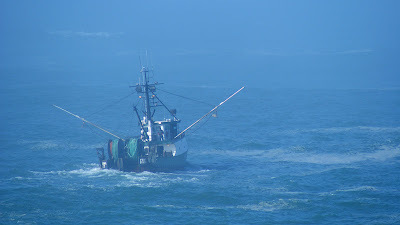 We were hoping to do some whale watching via local charters, but the ocean was tumultuous and the fog was thick. 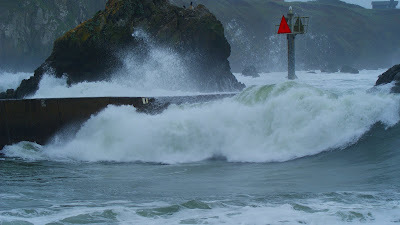 Above, the waves are cresting over the breakwater for Noyo Harbor! 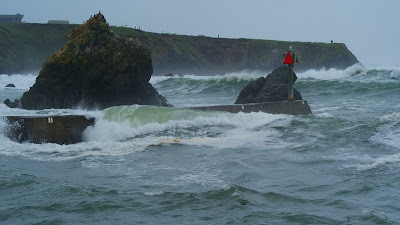 Again, the incoming waves are burying the concrete breakwater. Last year, I stood right there. I had, at one time, walked out to the red triangle. 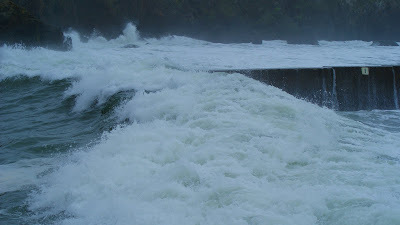 Today, I'd have been completely swept away! 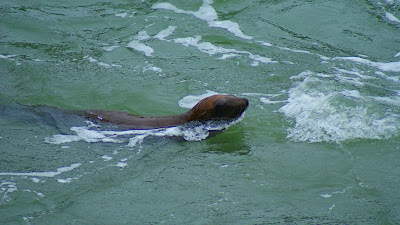 However, our friendly, local sea lions were still in evidence, in the calmer waters. 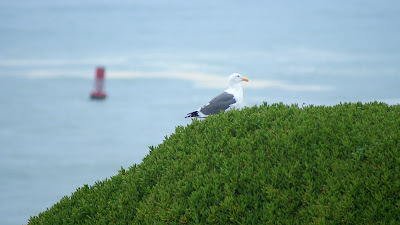 Taken with Sony A300, 75 - 300 lens at max zoom. 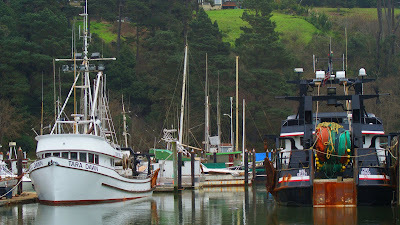 Fishing vessels in the harbor. 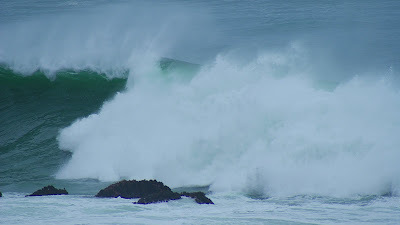 No one dared the nasty waves at the mouth of Noyo. Tara Dawn at left, and Miss Kelly, right. 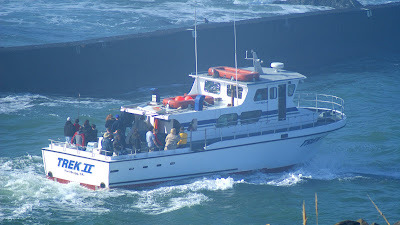 MK is Noyo's largest fishing vessel. 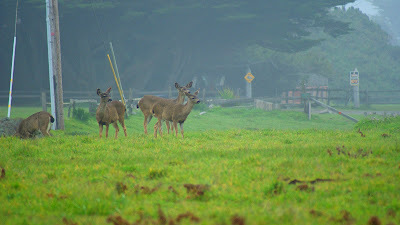 Local deer south of Noyo Harbor. 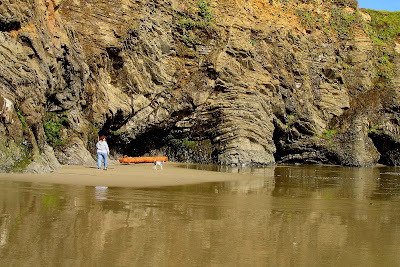 Not far from here, in the 1800s, women would stand near the cliffs and await the return of their fishermen from the savage Pacific seas. The waves were absolutely majestic. Further out, my zoom at full, the waves looked to be perhaps 20 to 25-feet. 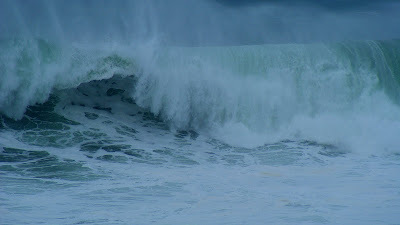 The waves crashed, the spume flew. I could watch the ocean for hours and hours and hours. It always changes, it's never the same; each day, each hour, is different. 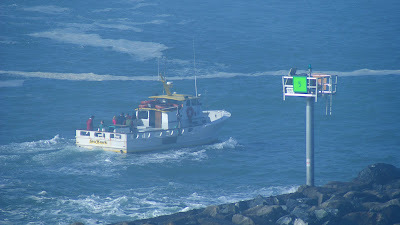 The red buoy in the background. 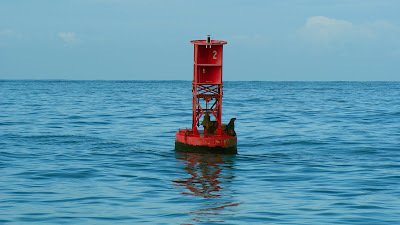 It's never tossed like the green buoy! The Trek II takes tourists out for whale watching. The problem? 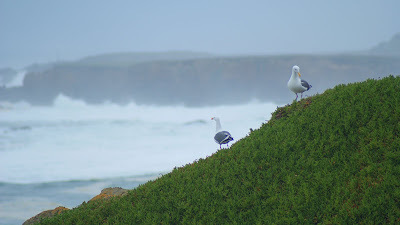 That was the last moment of clarity; the fog descended and socked in the coast. The Sea Hawk follows the Trek II on the 10 am whale-watching tour. After that, everything turned gray. 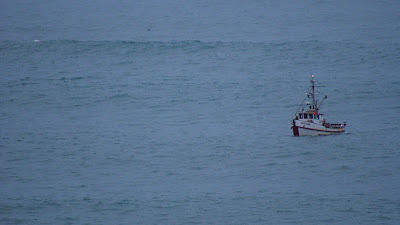 Because the waves had subsided a bit, the Donna J crew decide to try their hand at fishing, outriggers lowered for stability in the still-rough seas. 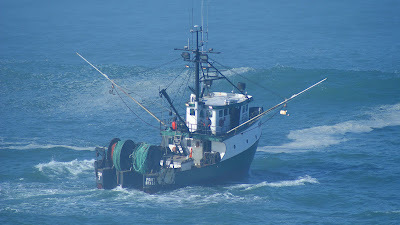 Donna J makes it out past the largest, most difficult harbor waves, both pitching and rolling in the rough Pacific waters. 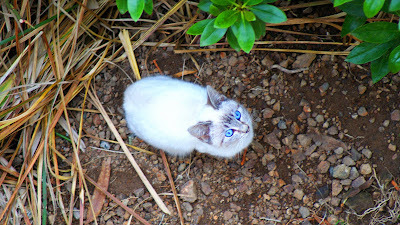 We fed the local feral cats from our top story hotel patio. We discovered that kitties like appetizers such as salami and provolone cheese. They also enjoyed a few pieces of dropped sourdough. A bit of a problem? The wind. As I dropped food below, only at the last second did I notice that I almost beaned the head of a woman peering over her own patio one floor below. How was I to know she would be sticking her head into the Flight Path of Kitty Food? The Coasties take the time to train whenever they can. I was disappointed, however, when the local station commander didn't insist his troops brave the worst of the weather and take their new aluminum 47-foot lifeboats built by Textron Marine into the thick of the weather. 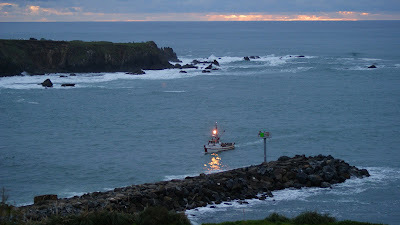 The motor lifeboat above is one of two possessed by the station at Noyo Harbor. These motor lifeboats (MLBs) were designed to withstand impacts of three times the acceleration of gravity, can survive a complete roll-over, self-righting in less than 10 seconds with all machinery remaining fully operational. Powered by twin Detroit Diesels producing 435 hp (324 kW) each, the 47 MLB can travel at 25 knots (46 km/h). 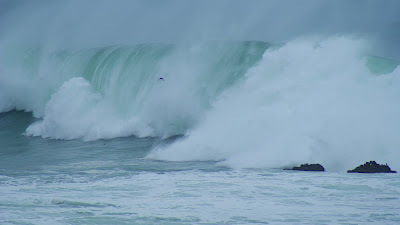 I've seen the waves at Noyo. And I've also seen the waves and visited the mouth of the Columbia River at Astoria. The Columbia River Pilots take some of the largest ships in the world on to Portland. Further, the Columbia River Bar Pilots Association guarantees those ships will negotiate the treacherous Columbia River bar successfully. And I've visited the Columbia River Maritime Museum. Not to be missed. 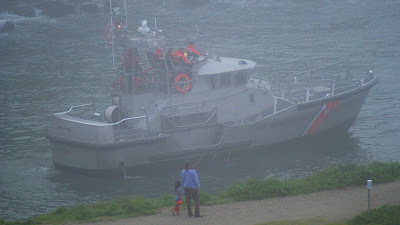 If the USCG can handle the Columbia River bar? Then why can't it can handle Noyo River?